The number of diocesan priests under the retirement age of 75 will be at least halved in the next ten years and the number of Sunday masses will have to be reduced, according to Bishop of Ossory Dermot Farrell. In a discussion document, the Kilkenny-based diocese is proposing the grouping together of parishes. Bishop Farrell concedes that the necessary changes "may result in a certain loss" but contends that they will also yield a gain. He outlined aspects of his unpublished draft plan in a letter to be circulated at weekend masses in the diocese and says that during the past year, a group comprising priests, laypeople and himself formulated options for dealing with the "different times" the Church is working in. 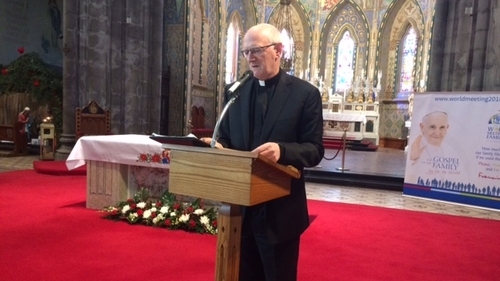 He cites research showing that a quarter (24%) of Ossory's Catholics attend mass each weekend in congregations ranging from several hundred to "just a few". And he calculates that the number of diocesan priests under the retirement age of 75 will drop from 40 to 20 in the next ten years. That is before possible deaths or early retirements are factored in. A diocesan spokesman said a further ten over-75s are currently in active ministry. Bishop Farrell said the plan being explored with parishes involves gathering all 42 of them into 14 groups. The bishop's letter rules out any suppressions or amalgamations of parishes but says they will be working together in new ways.